UK based DJ Percussionist Lyndsay is a DJ and percussionist . 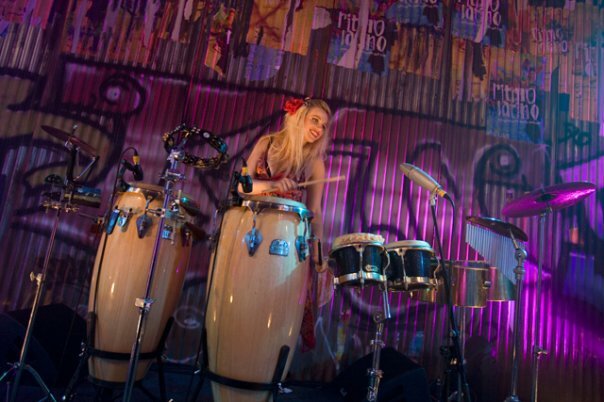 DJ Percussionist Lyndsay has a big passion for rhythm. To Lyndsay it doesn’t matter if it happens acoustically or electronically, but beats have always got her going. She plays everything from pop to electronica. Lyndsay started out with a classical background, at Trinity College of Music. Before finding her way through jazz, latin, rock and pop to what she plays today, she was influenced by a fusion of live and electronic music. DJ Percussionist Lyndsay’s passion is blurring the lines between pre recorded music and entirely spontaneous improvisation between electronic and acoustic music. Sometimes she DJs, someti mes she plays the drums and sometimes also both together. To Lyndsay it doesn’t matter, she just wants to make people dance. Between these various disguises, she has been able to play with Rihanna, Ricky Martin, The Black Eyed Peas, Girls Aloud’s Nicola Roberts, Kelly Rowland, Wyclef Jean, Luke Slater, Amy Winehouse, Billy Bragg and Reverend & The Makers. She has been on stage in the West End and beyond with Tap Dogs. As a DJ she has played at both London and Paris fashion weeks. She also performed at the Tate Modern and Britain, Elle Style Awards, Cosmopolitan magazine awards. Somerset House, Cartier, Mercedes, Landrover, HTC, Apple, The Four Seasons Hotels, Hard Rock Hotels, Christie’s, Chinawhites, Bunglalow 8, Mahiki clubs and for the Royal Families of Britain, Jordan and India. As well as sessions and playing with some incredible DJ’s including Miss Kelly Marie, Boy George & Luke Slater she managed to tour 5 out of the 6 continents in 12 months. For more information about DJ Percussionist Lyndsay, please contact us on 01322 412494 or send an email to info@platinum-djs.com.